Spare Parts reminds you why it’s always a good idea to root for the underdog. You may not have heard of this film, or its director, or maybe even the majority of its actors… but that’s no reason to take a hard pass. Spare Parts is based on the true story of a group of Hispanic high school students who form a robotics team that goes on to compete in a national competition against college teams who are better equipped, better trained and better funded. Needless to say, the obstacles they face along the way are many. Four teen boys, all here illegally, win your heart despite their differences. The actors who play these young men are probably not ones you are familiar with, but they do a stellar job. 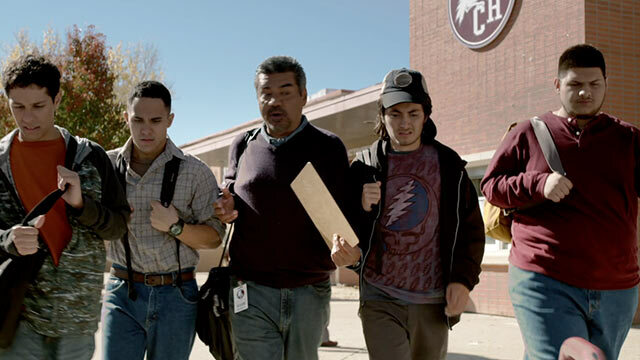 Carlos PenaVega plays Oscar, whose only dream is to join the U.S. Army. This dream is quashed when he’s turned away for being undocumented. For Oscar, this was his way to provide for his mother, and it’s his idea to enter the robotics competition in hopes of another route out of this life. He takes this idea to the science substitute at his school, who is temporarily in charge of the non-existent Robotics Club. A few others are persuaded to join, and eventually they have a team of misfits working together towards a common goal. Spare Parts shines in a number of arenas. It will draw people in with its big name stars: Jamie Lee Curtis, Marisa Tomei, and George Lopez. Each one brings laughter to the screen, all the while sprinkling poignant moments throughout. It is clear early on that the major theme is undocumented children living in the U.S. It’s an issue from the first scene where Oscar is turned away from the recruitment office to the very end of the movie, where they highlight the Dream Act in actual footage from Congress. At times, the theme is less overt, but for the most part, director Sean McNamara (Soul Surfer) is pretty up front about it. The movie takes on scenes dealing with alcoholic fathers, taking the rap for crimes to prevent documented family members from being deported, homelessness, the complete lack of a father, coming over the border illegally, and deportation of a mother. While it is an upbeat film overall, there are pretty legitimate issues on the surface that aren’t meant to be ignored. If you can embrace the movie, message and all, I think it has a lot to offer. The plot itself is a true underdog story that is fun to be a part of. You will laugh, you will cry, and it has a happy ending to boot. I love the title, Spare Parts. If you’ve ever felt out of place, this movie will make you feel right at home. This entry was posted on Thursday, January 15th, 2015 at 6:45 pm	and is filed under Film, News. You can follow any responses to this entry through the RSS 2.0 feed. You can skip to the end and leave a response. Pinging is currently not allowed. « Blood and Guts: ‘Mortal Kombat X’ Is Almost Here!